Isaac Taylor after Henry Howard. Timon of Athens. Act 4. Scene 1. Without the Walls of Athens – Timon. 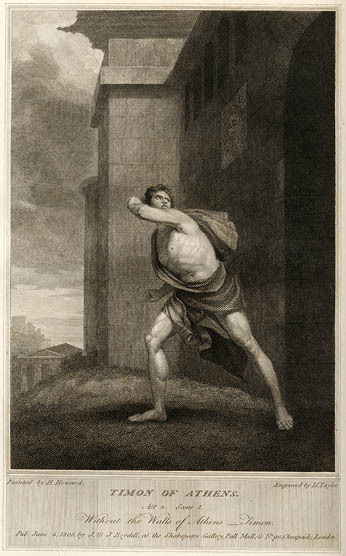 Engraving, 1803. Shelfmark PR2752 1807c C.4 V.7 Sh.Col. Folger Education was part of the Royal Shakespeare Company’s World Shakespeare Festival Conference last September, presenting a workshop, participating in a symposium on using technology in teaching Shakespeare, and represented on a panel discussing Shakespeare. It was an energizing and inspiring conference. While we were in London, my colleague and I had the opportunity to see Timon of Athens at the National Theatre. The production was part of the World Shakespeare Festival, a celebration of William Shakespeare as the world’s playwright. My reaction after seeing the performance was that it was too bad that more people wouldn’t get to see such an incredible production — and see Simon Russell Beale, who has been called the “greatest stage actor of his generation.” So, imagine my joy when I discovered that the production will be available in selected theaters in the US on November 1st. This is a production not to be missed. The Guardian called the play, “A fable about the toxic nature of a ruthlessly commercialised world.” The play is directed by Nicholas Hytner, and Time Out wrote that Hytner “… hurls Timon into the 21st century….” This is a play not often staged, and one that will resonate with audiences in the States. A list of broadcast locations is available. When you see it, or if you teach it now, it would be great to get your take on its relevance for students and/or to today’s audiences. Let’s take a break from our usual education-based Blog and pause for an adult beverage or two. After all, if you’ve been grading essays and teaching Shakespeare for a while, you may need a drink. One of my favorite libations is Rogue Shakespeare Oatmeal Stout made in Newport, Oregon. The Rogue Brewery website describes this brew as “ebony in color with a rich creamy head, earthy flavor and a mellow, chocolate finish.” I’m not sure about that chocolate, but it does taste good. It’s available here in New York and probably everywhere else. But if you’re ever in Oregon, be sure to stop in to one of the Rogue Brew Pubs. There are several of them and there’s even one in the Portland Airport. partnered with Eric Dunham of Dunham Cellars to produce a pricey ($65 a bottle) Cabernet Sauvignon, which they say has a taste of allspice, clove, hints of anise and chocolate-covered cherries. But the Pursued by Bear website is brilliant as it zooms in on the Globe Theatre and shows us that famous bear from The Winter’s Tale, complete with roaring. It’s worth a visit. They even have a Baby Bear Syrah which they say has “debaucherously nuanced flavors” of “baking spices, cumin and a lavender nose.” At $65 a bottle, it still is out of my price range. A few years ago, a former student of mine (now a teacher) came to a workshop I was giving and presented me with a bottle of Shakespeare Vodka by V’Guara. It’s been a while since I finished the bottle, so I can’t report on the quality; but the bottle is beautiful, and I keep refilling it with bottles of Absolut or Smirnof’f. It’s a great conversation piece as it has a see-through label with an image of Shakespeare on the back. If you’re ever in my neighborhood, stop in and I’ll pour you a drink. If you’d rather read what Shakespeare had to say about drinking, you should check out the The Boozy Bard, a book categorized by play which cites all the places where Shakespeare has written about drink, drinking, and drinkers. And finally, if you’d like to enjoy an adult libation and see a fine Shakespeare play, head to Atlanta and stop in to the New American Shakespeare Tavern®. The New American Shakespeare Tavern® is unlike other theaters. It is a place out of time; a place of live music, hand-crafted period costumes, outrageous sword fights with the entire experience centered on the passion and poetry of the spoken word. With an authentic British Pub Menu and a broad selection of Irish ales and premium brews, the Shakespeare Tavern® is a place to eat, drink, and nourish the soul. Taking a page out of Carol Ann’s book, I sat in on a couple of our High School Fellowship sessions recently. During this program, students study three of Shakespeare’s plays as scholars, actors, and audience members. Guest speakers come in throughout the semester to discuss a new perspective with them as they progress through the class. This week we had two very different guests: Dr. Patrick Tuite and Marcus Kyd. Dr. Tuite, a scholar and dramaturge, took the students through a couple of scenes from Richard III in both a facsimile of a First Folio and a modern edition. He called the First Folio a “blueprint for performance.” In the First Folio, there are several words that were capitalized (or not) in ways that would look odd to us, spelling was different, punctuation in some odd-looking places, and more that – to a modern eye – looks funny. These oddities are important for actors to see as they tell you more about who the character is and how they talk. Do they capitalize the word “Woman?” – if so, they might think more highly of women. Does the spelling help a rhyme? – perhaps it makes more sense in OP (Original Pronunciation). Is there a rogue apostrophe? – this might affect a hitch in speech. These oddities have been edited for modern readers and actors to look more like what they’re familiar with, but the acting choices made in the 16th century run throughout the folio text. Looking back helps us understand what performance looked like, and more about how the characters were originally conceived. For more on Editing Shakespeare, please see our YouTube playlist on the subject with Folger Editions editor Barbara Mowat. Two days later, the students met Marcus Kyd, a local actor and director, who will work with them on their scenes for their final performance. After the students were assigned their scenes (mostly 2-person, and some groups), Marcus guided them through discovering their characters with four questions you’d want to answer as an actor: 1) Who are you? 2) What do you want? 3) What are your obstacles? 4) What are you going to do about it? Then he had the pairs sit in chairs facing each other, and asked them to find the “hooks” in the lines of their scene partners that made them want to respond. The conversations in the plays have a lot of back-and-forth action in them – the characters respond to one-another, they don’t speak in a void. When they heard a “hook” they’d raise their hand (multiple hands, if there are multiple hooks), and put it down when their text responded to it. RICHARD: Her life is safest only in her birth. QUEEN ELIZABETH: And only in that safety died her brothers. RICHARD: Lo, at their births good stars were opposite. If grace had blessed thee with a fairer life. RICHARD: You speak as if that I had slain my cousins. The colored text is where the characters respond directly to each other. Even in longer passages, one character may run down a long list of hooks that another character then responds to one by one. The students’ homework was to take their scenes home and, based on their exercise, find the hooks in the text that their character wanted to respond to. And so in a few short days these students approached scenes from plays they’ve read and seen as both scholars and actors – with all the textual clues leading them towards a performance of the text. Shakespeare’s language is not insurmountable for its age, but knowing what to look for as actors makes many things clearer. Last week, I had the fortunate opportunity to meet with high school students participating in Folger’s High School Fellowship Program. I was especially fortunately because our guest instructor was Caleen Sinette Jennings, Professor of Theatre at American University. Through an afternoon working with Caleen, I learned several important things about Shakespeare and his language. 1. Each word can be a physical experience. Think about the way little children tell stories. They use their entire bodies to tell the tale. It’s like they can’t help but move and shake and wiggle and engage all of themselves because they are so excited. They act out the story. Shakespeare’s language invites us to do the same. The words are so packed with meaning they burst out of us. If we get up on our feet, it’s almost impossible not to find yourself moving as you say the words out loud. The words are parts of a play—a living thing. They are a series of physical experiences. 2. The behavior of the words provides us with clues into the state of mind of the speaker. Look at a phrase from Shakespeare. In this class, the students acted out Hamlet’s “To be or not to be” speech. These words are so well known, it’s tempting to just run your eyes over them thinking “yeah, I know this.” Instead, act each word out. Pay attention to words and phrases: nobler in the mind, slings and arrows, outrageous fortune, perchance to dream. Give over to the motions the body associates with the words. You’ll begin to understand Hamlet as you give motion to his words. 3. Sometimes the words fight with each other. Characters try to hold different “truths” in their minds at the same time. Characters deceive each other. Characters struggle to find meaning in experience. All this is expressed in words that are at odds with each other. Let the words fight. Give the words expression with your body that lets them fight. Character’s inner turmoil becomes evident as their words do battle. 4. Shakespeare is not hard to understand when you physicalize it. I’ve seen the light in young people’s eyes as they recognize they do understand the language. They get the meaning. The words make sense. Once they are up on their feet, putting the words into action, it’s not difficult to understand. In fact, it’s very much what they are experiencing in their lives. Thanks to Caleen and these great students, I literally saw Shakespeare come to life, right before my eyes. One of the plays our High School Fellowship group at the Folger Shakespeare Library is studying this semester is Richard III. Long considered one of the most evil of English kings, Richard III may be able to defend himself and change the way we look at him more that 500 years after his death. A recent archaeological dig reported in the The New York Times has uncovered what medieval scholars believe are the remains of Richard III. DNA studies and isotope testing are now underway, with results expected by early 2013. According to the Times article, there are those who believe that “Richard has been the victim of a campaign of denigration — begun by the Tudor monarchs who succeeded him ….” If the analysis verifies the remains as those of Richard III, what will this mean for those of us who teach the play? What popped into my brain was a character I’d played in Taming Of The Shrew. I was Petruchio going back to get his wife in Italy, and I was a sort of ‘Mamma mia, nice ol’ Italian guy’. So I thought I’d do something like that. I went on and on about spaghetti and meatballs. After half an hour the producer said, ‘cut, stop, we’ve run out of tape!’ And he called Nintendo and said ‘I’ve found our Mario’. Mine was the only tape he sent back. That’s right: the cheerful, bouncy voice of the Nintendo icon introduced in Super Mario 64 had been inspired by a character from Shakespeare voice actor Charles Martinet had once played. So when you’re reading the play aloud in your classroom together, encourage the students to play, to experiment with different tones, inflections, accents – making the character something unique to them. Playing and having fun – like when they’re playing Mario Kart at home. They have to try different tactics or turns and in doing so they create their own style. Acting is about experimenting with your voice and body to find how the character speaks through you. 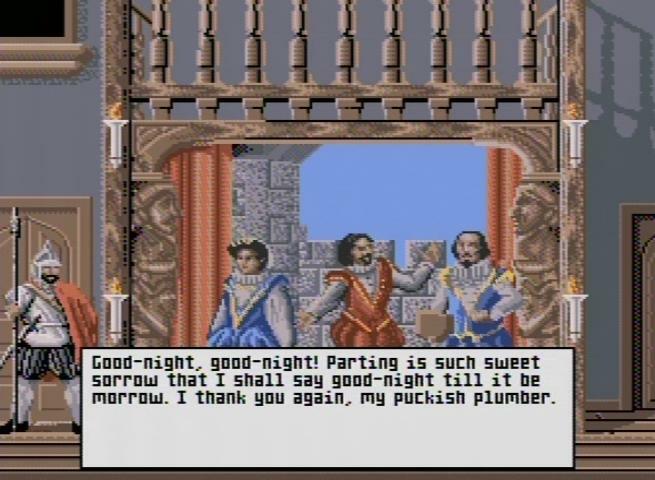 BONUS: In a search for a good image, I came across this extensive list from a couple of years ago of the many ways Shakespeare has appeared in video games. Enjoy! Where better to teach Macbeth than in a monsoon? When shall we three meet again? In thunder, lightening, or in rain? That’s exactly what we did one muggy July afternoon when the ominous skies finally split, releasing a torrential downpour. For an hour already we had been rehearsing indoors with the three teenagers cast as the prophetic witches of Macbeth. But, the result still wasn’t right. Despite their hard work, the students’ cackling voices were stilted, their gestures artificial. But with the rains stabbing the windows I had the harebrained idea of taking our rehearsal outdoors. Luckily, my students were just as excited and we all thundered down the stairs and out the front door – raising more than a few eyebrows from the other young thespians practicing in the halls. The weird sisters hand in hand, posters of the sea and land! The three girls danced in the storm. They yelled their lines to the waterlogged clouds. They spun in circles, throwing their linked arms out, embracing the heavens. As the sky cleared we traipsed, dripping, back inside. Back upstairs, back to rehearsal. But something had clicked: they no longer acted out the witches, they embodied them. For the last two years I’ve taught at the bookends of teenagedom – college students in Chiang Mai last year and middle-schoolers in Charlestown this year. But this summer I had an opportunity to see what happens in between the two. Throughout the school year I had interned with the locally-based Actors’ Shakespeare Project, which, besides producing a great season of Shakespeare, sustains a vibrant education arm – teaching the Bard in schools, in after-schools and in lock-up facilities. When my school year ended, I joined their amazing teaching team, under director and professional actor, Jason Bowen. When most teens might prefer to be sunbathing on the beach or cooling off at a neighborhood pool, nineteen students – ages 13 through 19 – chose to spend three weeks of their vacation studying Shakespeare. Our ensemble came from all across the Boston area. They came from the suburbs and they came from the heart of the city. They came from public schools and exams schools and private schools. Some had previously come from youth detention centers or were once in city gangs. They came with years of acting camps and school plays and they came with no formal theatrical training. And every morning they converged on the small converted fire-station that became our joint home for a large part of July. Very quickly I realized I was not in middle school any more. Within two short days, our collection of strangers had transformed into a supportive and engaged ensemble. In contrast to my sixth-graders, with whom I had to devote large portions of time to juggling behaviors and attitudes, here in the stage-lit black box, everyone came ready to learn and more importantly, to experiment. We took the group outside and had them yell Shakespearean insults at each other with so much force that dog walkers and passing cars slowed down and stared. We worked one on one with students: Lady Macbeth rolled and screamed as she explored the sleep walking scene; Ross ran up and down stairs, up and down, up and down before delivering, out of breath, the victorious news to King Duncan; the Porter walked around with a balloon under his shirt attempting to mimic a drunken stagger. And students worked on their own – in corners of the upstairs rooms, on the stairs, in the front hall. They scribbled notes in the margins of their scripts, they checked and rechecked different translations, and they repeated their lines under their breath – over and over and over. Differences in age and experience and background dropped away. Two girls playing Lady Macbeth got genuinely excited to look up etymologies in the two-volume Shakespeare lexicon. The boys playing Macbeth took their work home and stayed up several nights past midnight (once til 2 am) studying their lines. Friendships were formed over blockings of stage fights, experimentation with silly accents, and concocting of fake blood (equal parts chocolate and strawberry sauce). It was a space where being a Shakespeare scholar was “Cool”. At the end of three weeks we swept the stage, rechecked the light cues and opened the doors of our theater to admit our audience. If only all classrooms were black-box theaters: there is no better place to learn. No desks, no pencil shavings, no wall clocks. Paradoxically, acting allows students the freedom to act like themselves. In school, students are consumed with adopting personas that establish them within the hierarchy of their peers. But, in the black box, demure students learn to scream and cocky ones to cry. Everyone gets to yell Shakespearean insults at each other and then, ten minutes later, to clasp hands. By lunchtime each day, our ensemble would have attempted so many characters that slouching back into school personas seemed silly. And that’s when the real learning took place. Our black box Shakespeare theater granted our students the permission and the freedom to yell and laugh and dance and sing in the rain. Jessica Lander has taught English to Thai university students, art to Burmese refugee children and Shakespeare to inner-city Boston middle-schoolers. In her blog, Chalk Dust, she chronicles her experiences as an educator in excellent prose. We look forward to collaborating with Jessica for future blog posts!